Which is the most frustrating part of an article? Yes, it's the First Fifty Words. We get so stuck at the starting point when writing an article, that it's almost impossible to go ahead. But what if there were not just one, but three ways to create drama in your article? That would be cool, wouldn't it? Well, here you go. Not one, but three ways to start your article with drama and get attention. In 1974, New York had a problem that didn’t seem to go away. No matter where you rode the subway in New York, there was graffiti painted both inside and outside the trains. Young men with their spray cans covered the city's trains with their version of art and soon the subway came to be seen as a symbol of a city on its way to the gutter. They even went through one amazingly misguided strategy to paint all the trains white. Sure enough, The Great White Fleet as they called it, was soon covered with a fresh layer of graffiti. The city couldn't seem to think of any way to solve the graffiti problem. In 1984, Gunn was appointed as the president of the New York City (NYC) Transit Authority. Gunn had a track record of cleaning up subways in Boston and Philadelphia. Even so, the city of New York had been battling the graffiti problem for over a decade. What radical idea could Gunn implement that would turn back the clock to better times? The moment a train was bombed with graffiti, it was to be pulled over and painted. If a train car was being repaired, they'd ensure the car remained graffiti-free. If they found graffiti on a train overnight, the NYC Transit Authority would sweep in and repaint the train. Even during rush hour if they found a train had been “bombed”, they would pull it back to the yard and clean it up, so that the graffiti was nowhere to be seen. On May 12, 1989, the city declared victory over the city’s graffiti artists. You started reading this article to find out how to write the First Fifty Words. But before you knew it, you were transported back to New York, the subway and the graffiti dilemma. And the reason why you got to this point is because of the drama created by the First Fifty Words. When your article, presentation or webinar has a powerful opening, the client gets pulled along happily. And yet, it’s not always easy to know how to go about creating those First Fifty Words. So today, let’s take a look at three ways to create the drama. In the 1980’s a persistent drought swept through the African Savannah. Watering holes dried up, food was scarcer than ever. Yet, one animal, the kudu, wasn’t affected as much. This is because the kudu can continue to get its nutrition from the hardy Acacia tree. Most other animals don’t tangle with the Acacia’s thorns, but the kudu navigates its way between the thorns to get at the juicy leaves. But suddenly dozens of kudu started dropping dead. When the kudu were examined, there seemed to be no reason for the deaths. They looked perfectly healthy and didn’t appear to be suffering from any malnutrition. However, the number of deaths soon soared into the hundreds, then into the thousands. While it was devastating for the ranchers to see the kudu fall to the ground in heaps, they were also puzzled by the inconsistency of the deaths. On one ranch the kudu continued to thrive. On other ranches, their numbers decreased precipitously. There seemed to be no answer to the question, until they considered the number of kudu on the ranches. On others there were a lot less. As the drought raged on, the kudu had no other vegetation but Acacia leaves. Once the tree lost all its leaves, it would no longer be able to harness sunlight. In effect, the Acacia trees would die. In an act of self-preservation, the tree started producing more tannin. Not just more tannin, but lethal amounts of it. Biologist and African herbivore expert, Professor Woutor Van Hoven examined the rumen of the kudu and found the digestive system to be in complete shutdown. Now tannin is a compound can only come from a natural source. It wasn’t hard to point fingers at the Acacia tree. The tannin was getting inside the digestive system and killing the kudu. In effect, the Acacia trees were culling the kudu. On the ranches with sparser kudu, the tannin wasn’t anywhere close to these lethal amounts. The plant was clearly going through a stage of self-preservation. And we all know this fact of attention-getting to be true. But we aren’t sure where to find the stories or how to make them work and then how to reconnect them to the article. Those are three elements in themselves, so let’s start with finding the stories. I tend to find my stories all around me. But if that’s not a good enough answer for you, here are a few links. Go to www.smithsonian.com, or live science.com, history.com, bbcearth or listverse.com. In effect, what you need to do is to go any of these sites, spend some time reading and then save whatever you need to Evernote. Of course, as I keep harping on repeatedly, without Evernote, you’re just wasting your time. I can literally find hundreds of stories in a few minutes, precisely because of Evernote. Finding stories was a bit of a nightmare at first, but I soon realised I could find two or three stories a day that related to history, geology, biology and case studies. Added to that were my own personal stories, and so the first problem was done and dusted. If I could find three stories a day, I’d have about 21 stories by the following week. And no matter how prolific a writer or speaker I turn out to be, I can’t go through that volume of stories. But how do you know which stories work? The most boring story is one that stays on a single track: either up or down. A good story is like the kudu story. It started out with the drought, went to the fact that kudu didn’t care and neither did the ranchers. Then kudu start dying, yet the next ranch with fewer kudu has no such trouble. The biologist comes in, investigates and we have the killer: the Acacia tree itself. It was an act of self-preservation. That story has bounce all the way, as do most good stories. You’ll probably have noticed the same bounce for the NY subway story. How the situation went from bad to worse, until David Gunn came in and put an end to the graffiti. You know how to find the stories and how to store them in Evernote. You can even find the bounce in these stories. What remains is how to connect them to your main content. Notice how I finished the kudu story? The last line was about self-preservation. So what would the theme of the article be? Sure, self-preservation. But what if the last line was “speedy response”? Well, then the article would head over to “speedy response”. The last line of your story, whatever you happen to choose, is what creates the bridge towards the rest of the article. When you go to Amazon.com and read the reviews of The Brain Audit, you’ll find most of the readers seem to agree on one fact. Many of them seem to suggest The Brain Audit is exceedingly easy and refreshing to read. But what makes it refreshing? Or rather what makes content boring? It’s clearly the lack of stories and analogies. You can’t turn more than two-three pages without running into analogies and stories in The Brain Audit. 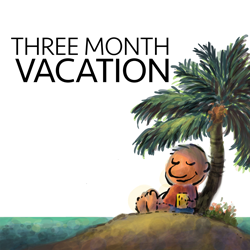 The Three Month Vacation Podcast has at least three stories or analogies and it could go to as many as six or seven. Articles, webinars, reports—they all have stories and analogies. You need to start looking for those ups and downs. And then it’s a matter of reconnecting by inserting the last line into the story, so it reconnects with the article. But stories are just one way of taking on the First Fifty Words. The second method is to disagree with your headline. In 1949, the ad agency DDB had a reasonably big challenge. They were given the opportunity to sell the Volkswagen Beetle. This wasn’t just another car. It was a post-war German “people’s car”, connected with development plans that went back to Hitler himself. Plus the car was small, slow and considered ugly. Added to the challenge was the fact that DDB had a paltry advertising budget of just $800,000. So how do you create instant drama when the odds are stacked against you? Back in 1949, the war had ended and overblown consumption was the order of the day. American cars were big, bulky and drank tons of fuel. All the advertising pointed to how fast most American cars happened to be. All, except Volkswagen, that is. One of their earliest ad took almost everyone by surprise. It said: Presenting American’s slowest fastback. And the ads talked about how the cars wouldn’t go over 72 mph (even though the speedometer shows a top speed of 90). What Volkswagen Beetle advertising did was create intense drama by disagreeing with the status quo. The very same principle applies to your article writing and gives you the clue as to what you should be doing as well. To snap your audience out of whatever they’re doing, it’s a good idea to disagree with the prevailing situation or idea. And since you’re the one who wrote the headline, what better way to go than to disagree with your headline? You’d think the article would continue in the vein of increasing prices, wouldn’t you? But instead, it goes the other way. The first paragraph instructs you to reduce your prices in half. Then down to a quarter of the original price. And then the text goes on to explain something you’re already quite aware of: that reducing prices is a very bad strategy. However, the technique it uses is what gets your attention. Instead of going in the direction you’d expect, it moves in quite the opposite direction. Disagreement works because of the mild shock, and the consequent curiosity to figure out what’s happening. But it’s one thing to examine an ad or an existing article. How do you create this disagreement in your own articles? Let’s start off with a headline: The 3 Keys To A Perfect Ayurvedic Diet. How could you disagree with this headline in your first paragraph? Start off by thinking how you could sabotage the perfect Ayurvedic diet. Got the idea, yet? All you need to do is think up your headline and think of the exact opposite behaviour. Let’s try another headline, shall we? How to get your projects done using an unknown system of time management. Now let’s disagree with the headline. Time management is an erroneous concept, which is why most of us struggle to get anything done. Haven’t you gone through whole days where you’ve had loads of time, but still failed to get anything done? That’s because we don’t really work with time. We work with energy instead. You’re pushing in a headline that seems to talk about one thing but the opening paragraph seems to disagree. But you don’t have to keep the disagreement going. After you’ve made your point in a paragraph or so, you can go back to the original premise of the article. You’ve completed your mission. You’ve woken up your audience with the disagreement and they’re keen to read more of what you have to say. So far we’ve looked at stories. We’ve also looked at disagreeing with your premise. But there’s a third way that really helps when you’re feeling blank. And this method is called the “list method”. Let’s find out how we start articles with lists. Lists get attention and especially when you use it within the First Fifty Words. And in case you’re wondering, the first list that comprised of the Netherlands, USA and UK, it was a factor of social trust. In the Netherlands, 7 out of 10 people say they trust each other. In the US and UK, only 3 out of 10 people seem to have social trust. However, we’re not here to debate the issue of social trust. What we’re looking at, is the power of lists when used in the First Fifty Words of your article. And rightly so, because a list is a sequence of elements and somehow that sequence needs to end up in a logical place. So if your headline was: “How to get a business up and running in 90 days”, you could start your article with a list. That list immediately catches the attention of the reader and keeps that attention as you transition over to the main article. Unlike a story that needs all that bounce and mystery, a list is almost sterile in its approach. You don’t even need any disagreement in a list. If anything, a list seems to take the reader right to where they want to go, just like a recipe. And that’s why lists are so cool, but there is a downside. Lists are so spartan that they stand out. If you’ve used a list to start up an article recently, you’re probably going to have to wait to use a list again. The very format is so conspicuous that it requires a good deal of time to pass before you can re-use the technique in another article, podcast or presentation. Nonetheless, they are great starting points and in you’re in a tricky situation, start with a list. In this very article, we ran into the story of the NY subway, the kudu on the African savanna and the story of the Volkswagen Beetle being introduced to America in 1949. Stories are easily the best tool to get the attention of your readers within the First Fifty Words. It’s what I use consistently in books from The Brain Audit to Dartboard Pricing. If you find it easy to read the books, yes, it’s because of two elements. The first is the structure of the book, but easily the biggest other factor is the sheer volume of stories and analogies that help you understand the concepts faster and more permanently. The method we looked at was the factor of disagreement. And the way to go about disagreeing with your headline is to write a headline e.g. How to buy a second hand computer that will last six years—and then go in the opposite direction. Tell the reader a story about computers that failed. Go the opposite way and you do what DDB did with Volkswagen Beetle. And this method sure gets a ton of attention. This method is the easiest of all. For instance, if I wanted to start this article with a list, I could start with the three points we’ve covered, namely, “The power of the story, disagreeing with your premise and lists”. And that would get the reader curious enough to want to read more. Then I could continue the article by simply explaining each of the points and fleshing them out in detail. But where should you start? What’s the ONE thing you can do? If you’re stuck for time, try the list today. But ideally the best thing you can do for the long run is to fire up your copy of Evernote. Start saving stories. Go to BBC Earth, History.com, ListVerse.com, Smithsonian.com and start saving stories. There’s nothing more powerful than stories especially when you’re starting up the First Fifty Words. Well, they do. Within the first three seconds of reading an article or an email, your client is already making a decision whether to read on. Many of us aren’t restricted to email. We use webinars, video, podcasts and presentations. And all of these media have one thing in common: they all need a great start. Find out more about: Learning how to really create outstanding openings (whether in articles or any media) is deeply gratifying. And powerful. Your posts are too long and detailed. Plus, you stuff them with interesting facts and cunning ideas that make me wanna up my game. Truth is, I rarely finish posts half as long as yours. Yet, with you, each sentence I read forces me onto the next one. Stop doing that!